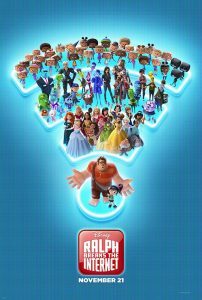 Ralph Breaks the Internet is the follow-up to the 2012 smash Wreck-It Ralph and stars John C. Reilly in the titular role as the lovable video game character, Ralph. After going from zero to hero in the previous film, Ralph has become content in his day to day life in the video game hub at Litwak’s Arcade. By his side, every day is his best friend Vanellope von Schweetz (Sarah Silverman), who’s also earned respect and her place back as top racer in her own game: Sugar Rush. Unlike Ralph though, she wants more than just going through the predictable motions every single day. Cue Ralph, who has the utmost admiration and love for his best friend, to sneak into her game one morning while a young girl is playing and create a new path for her to venture down. Unfortunately, in an incredibly clever scene (the first of many to come throughout the film), Ralph’s endeavor causes the player to fight the apparent “glitching” of the game and break the steering wheel causing Sugar Rush to be shut down and all of its characters within to become homeless when the cost of the replacement on eBay is way beyond what the game is worth to Litwak (Ed O’Neill). After Ralph and Vanellope overhear the solution to their problem, they decide there’s only one thing to do – venture off into the metropolis that is the Internet, find eBay and get that new steering wheel for Vanellope. And what a wild ride the audiences are in for when they do. 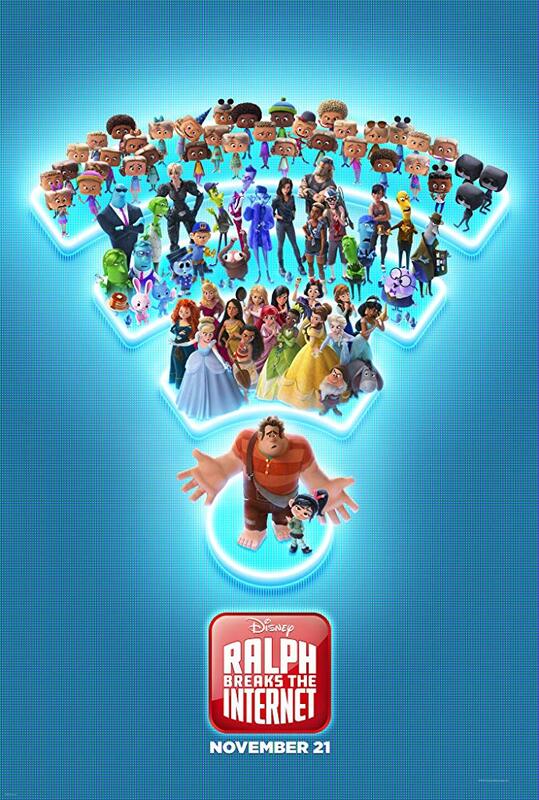 Ralph Breaks the Internet started off much like one would expect, with more crisp animation and pretty much picking up right where it’s predecessor left off. When Ralph and Vanellope reach the world of the Internet, however, it becomes something much more exciting and relatable. Directors Phil Johnson and Rich Moore find a way to cleverly illustrate how exactly the internet works through this movie. As someone with a computer management degree, the second they enter the newly installed WiFi router, I don’t think my smile ever left my face for the remainder of the film and I’m sure other techie viewers will feel the same way. The Internet landscape is remarkable. Some of the cinematography here was utterly gorgeous (almost, if not just, as gorgeous as the land of the dead in last year’s Coco). Companies like Google and Amazon can be seen on the tallest skyscrapers, while little bluebirds are flying around tweeting as they represent Twitter, just to name a few. There are cat videos, unboxing videos, online gaming videos – literally something for everyone who spends even the tiniest amount of time on the internet to recognize and relate to in some way or another. I think I might have even been the only one laughing when Ralph finds the remnants of what used to be Geocities (RIP) in the deepest corner of the internet. After not understanding how exactly eBay works, Ralph and Vanellope become in debt and henceforth starts the first of a couple race against time scenarios in which the film depends on for urgency. They look toward pop-up ads advertising making money playing video games. This leads them to meet Shank (Gal Gadot) in a racing video game where Vanellope quickly feels at home. What I loved most about this film was while taking a clever approach to personifying the internet as a place to physically go to, there’s a lot of tongue in cheek references and even jabs to Disney’s own properties. There’s a portion of the film that goes to a Disney domain where Star Wars, Marvel, and classic Disney characters all live as one. As mentioned above, Vanellope meets a slew of princesses (if I’m not mistaken, all voiced by their original voice actors) for an incredibly entertaining self-reflection piece. They also play an even bigger role later on with a wonderful musical medley in the third act. In the end, I thoroughly enjoyed Ralph Breaks the Internet. Its predecessor was so incredibly sharp for a video-game themed movie, that I felt this might have struggled to be on the same level. I think adding the element of the world wide web and doing so with such poise allowed the franchise to elevate into something even greater. Reilly and Silverman really bring Ralph and Vanellope to life with their voices making their characters and friendship feel as real as possible.